Tender braised beef is slowly cooked in a sauce of sherry, garlic and ginger until it is falling apart. 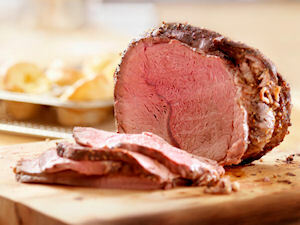 The delicious, earthy flavors of the beef are complemented by the spices and ginger. Serve with roasted root vegetables or brown rice for a memorable winter dish. In small bowl whisk together sherry, garlic, ginger, salt, and pepper. Add green onions and set aside. In large skillet heat peanut oil over medium heat. Quickly brown steak (apr. 2 minutes). Add sherry mixture and cook, stirring for about 3 minutes. Add chicken broth and simmer for 1 1/2 -2 hours until meat is tender and cooked through. Beer, beef, and Brussels sprouts—does it get any more Irish than this?